Glucose is a simple sugar that functions as a main source of energy in the body. Glucose is obtained from the food we eat and the liver where it is stored. When food is digested, this sugar is absorbed into the bloodstream where it can be taken up by muscles and tissues to be converted to energy, or is stored as glycogen in the liver for later use. Absorption of glucose from the blood into cells requires insulin. Insulin is a hormone produced by the pancreas that is released in response to elevated sugar levels in the blood. It works by signaling certain receptors on the outer cells of muscles and tissues to become active, allowing for the movement of glucose into the cell. 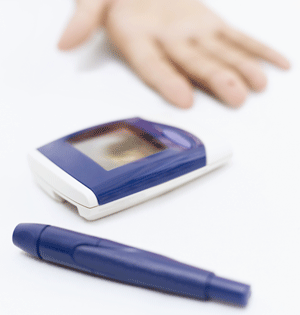 Insulin thus lowers blood sugar, and as blood sugar level drops, so does the secretion of insulin from the pancreas. Diabetes Mellitus refers to a group of diseases that affect the absorption of glucose from the blood stream, causing high blood sugar. Chronic or long-lasting diabetes conditions include type 1 diabetes and type 2 diabetes, which differ in how insulin is produced and used. While the improper functioning of insulin in the body is the general basis of either form of diabetes, the precise causes differ in each type. Type 1 diabetes typically affects younger individuals and the exact cause for the onset is unknown. Genetics seem to play a role, as having a family member with type 1 diabetes increases the risk of developing it oneself. Viral infections, such as mumps or rubella, have also been linked to the onset of type 1 diabetes but conclusive evidence on exactly how is limited.5 Because of the damage to the beta cells, type 1 diabetes is referred to as insulin-dependent diabetes mellitus (IDDM). It is also sometimes called juvenile-onset diabetes. Type 1 diabetes usually develops symptoms rapidly and the condition is often diagnosed in an emergency setting. Emergency complications include ketoacidosis and hyperglycemic hyperosmolar coma. Diabetes Mellitus has no cure, but it can be treated and controlled. Depending on the type of diabetes, blood sugar monitoring, insulin and oral medications may play a role in treatment options. For those with severe type 1 diabetes, a pancreas transplant may be a necessary option. No matter which type of diabetes one is diagnosed with, certain lifestyle changes must be put in place to properly manage the disease. A healthy diet must be followed, with restrictions on fat and sugar intake. Physical activity, especially aerobic exercise, should be a part of one’s daily routine. Exercise not only reduces the amount of glucose in the blood by increasing its use as energy. It also helps to increase insulin sensitivity in muscles and tissues. Maintaining a healthy weight is also a large part of controlling the disease and eliminating risk of complications. 1.Gusdon AM, Corbett JA, Matthews CE. Type 1 diabetes: Islet inflammation – the contribution of cytokines and beta cells. Drug Disc Today Disease Mech. 2006; 3(3):367-372. 2. Shoelson SE, Lee J, Goldfine AB. Inflammation and insulin resistance. J Clin Invest. 2006; 116(7):1793-1801. 3. Duncan BB, Schmidt MI, Pankow JS, et al. Low-grade systemic inflammation and the development of type 2 diabetes. Diabetes. 2003; 52(7):1799-1805. 4. Donath MY, Schumann DM, Faulenbach M, et al. Islet inflammation in type 2 diabetes: from metabolic stress to therapy. Diabetes care. 2008; Suppl 2:S161-164. 5. Filippi C, von Herrath M. How viral infections affect the autoimmune process leading to type 1 diabetes. Cell Immun. 2005; 233(2):125-132.